windows – In the shadow of that which was forgotten. 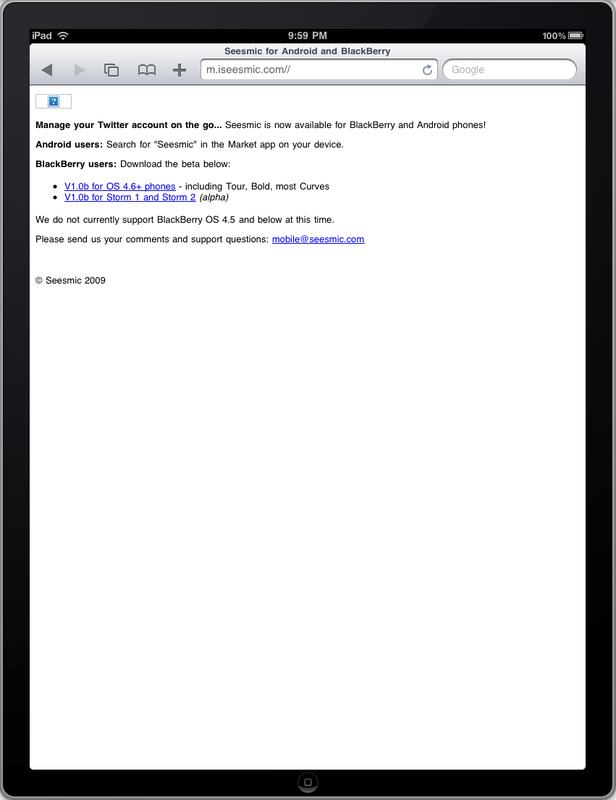 Exactly 2 years ago Seesmic purchased Twhirl and shifted from a video conversation platform to a twitter client, i will continue to make a brief overview of the process as it provides a extremely interesting and relevant case. I started following Seesmic when it was still a video site, behind it is Loic Lemeur a well known entrepreneur highly involved in social media and the father of the LeWeb conference, when he started Seesmic he even moved to San Francisco getting people like Pierre Omidyar, Reid Hoffman, Stephen Case on board and two series of founding $6M each. By this time there still was no business model but Loic’s goal was to have a impact and create value and like every investor knows, that eventually blooms into a business, by the end of 2008 however there were already signs of trouble with 1/3 of staff being laid off, early into 2009 a web version of Seesmic’s twitter client was released then silence until early 1010 when Loic used Microsoft’s Professional Developers Conference as a platform to launch Seesmic for Blackberry and Android, which signaled the shift toward Windows, Loic himself switching to Windows after complaining about issues upgrading OSX to Snow Leopard. The mobile and web versions joined the initial desktop Seesmic twitter client that ran on both Windows and OSX courtesy of Twirl’s Adobe Air codebase, so by now you could say that they had everything covered, except one minor thing, the iPhone, and in two days from now the iPad, which brings me to the reason why i started writing this. Sure, you could argue that they identified the niche in the lucrative and less competitive Blackberry/Windows space, apparently they quickly hired a bunch of romanian windows developers and eventually even partnered with Microsoft to create a windows only flavor of Seesmic for the masses, Seesmic Look, so they could afford to ignore iPhone and the iPad markets, saturated with independent developers and highly competitive, even if Loic had the founds and the levers to give it a edge over anyone else. 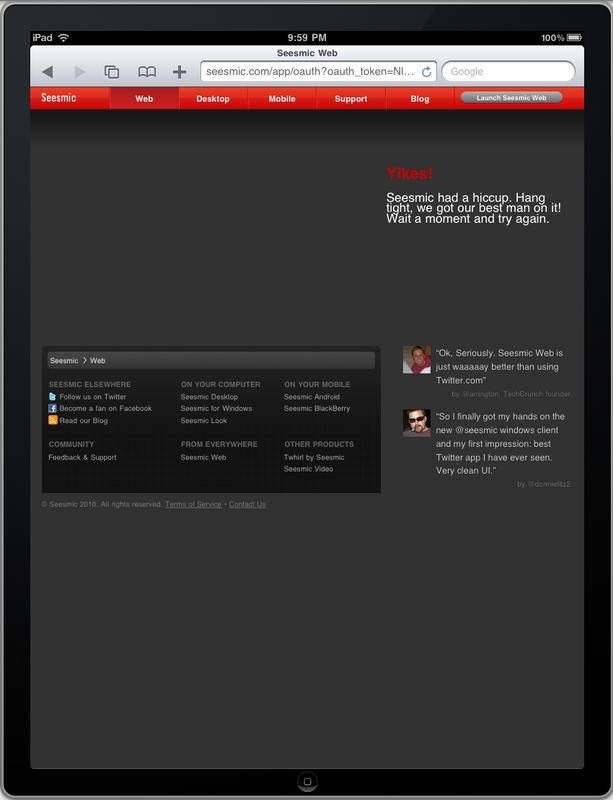 Either way Seesmic makes for a extremely interesting case study, i gave up waiting for a native OSX/iPhone client, but things are not looking good for the days ahead, here is how it will look: people opening seesmic.com from a iPhone and more importantly from the iPad will be thrown into a dead-end with broken image links and suggestions to get the Android and Blackberry clients, even if they know the url to the web based Sesmic client they will be unable to access it from mobile browsers, and there is no native Sesmic in the AppStore either, which brings the options to 0. 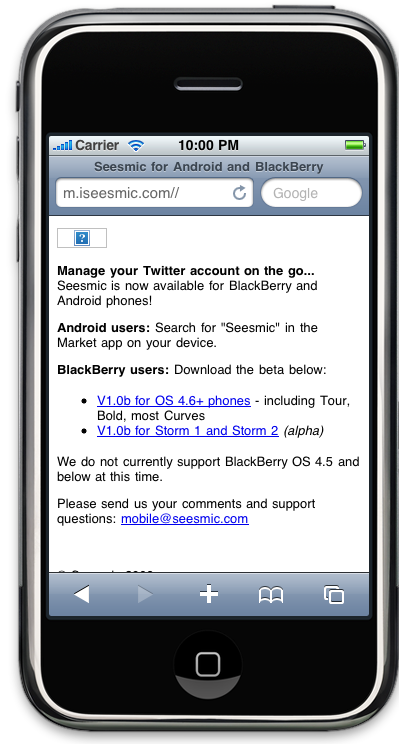 Seesmic’s web based client does not work on mobile browsers. I recently replaced my trusty UltraX keyboard and mouse with the Logitech diNovo Cordless Desktop for Notebooks and i had a seroius problem with pressing the Sleep button every time i picked it up so i just had to disable that. The problem is that you can not disable it from windows if you are on a notebook with ACPI based power management instead of APM and the drivers do you no justice. And you only have the option of shutdown or sleep for the sleep button in the windows interface , but by directly modifying the registry you can set it to a third “do nothing” action , which i promtly did , it is a dirty hack but it serves its purpose (reg file attached , needs reboot after run). Next thing was not so much a problem but a nuisance , the mail button mapped to outlook express , the email client nobody uses , so i figured i should at least make that start total commander , so i produce a 3 line app to replace the outlook executable with which starts total commander. Besides the unconsistency in button placing of Insert and Del and the somewhat tiny mouse this is a good and confortable kit but it sorely lacks some serious key mapping features , just do not jump too soon at the bluetooth version , it seems to be affected by serious lag .